Valve cancelled the Major status for the tournament. 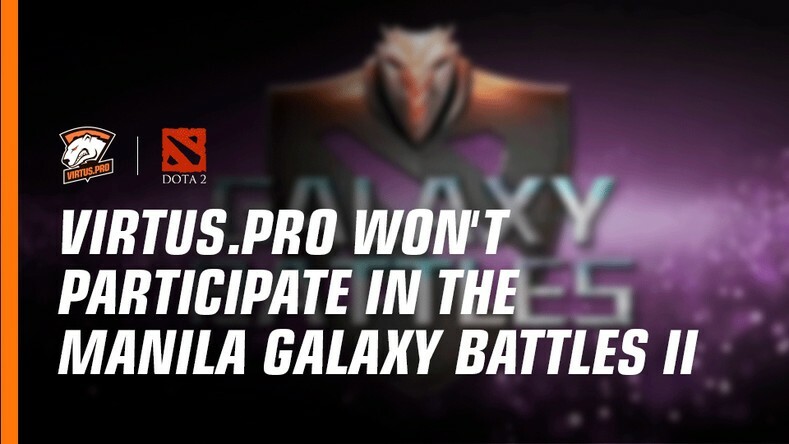 Manila Galaxy Battles II tournament to be held in the Philippines from 15-21 January, was deprived of its Major status. Therefore, Virtus.pro won't participate in it despite the direct invitation from the organizers. The general manager of Virtus.pro Roman Dvoryankin: “Considering yesterday's Valve's resolution regarding Galaxy Battles II official Dota Pro Circuit championship status withdrawal, we have made the decision of declining the tournament's invitation. I wish to thank Valve's management for effective addressing of the problem and excellent communication with participant teams. The status withdrawal from Valve was the main reason behind our cancellation of the invitation. The said status, among all things, imposes additional standards of players' safety, event's technical security and logistics on the event's organizers. Furthermore, the participation in rating tournaments has always been our main goal, therefore Galaxy Battles DPC points loss absolves the tournament of sense in that regard." VP Dota 2 roster will continue the Moscow bootcamp, and ESL One Genting 2018 will become the year's first tournament for us. ESL One Genting 2018 Minor will take place 23-28 of January on the Genting Highlands resort. The tournament's prize pool - $400 000 and 400 DPC points.